the WATER LILY - 1513693587s Webseite! The book is based on the experiences of the handmade homeopathic drug preparation (trituration) and proving, of the so far less known plant Nymphea alba (latin), 'The Water Lily'. A pictorial narrative written compendium of this astonishing effective conception. The author, Frauke Katharina George (born as Wegmann), describes the deep picture, its impact symptoms and areas of influence of the homeopathic drug. Latter mainly relates to the loss of natural sensual femininity in todays-rushing-world, often airtight, involving the effects of the beauty of original composition between man and woman. Even the well known term 'Nymph' refers to the affected areas of the drug action. The interpretation of 'Nymphea' stands for 'female deity', 'nature deity', 'bride'. A Lotus flower is considered as holy plant and symbol for fertility, purity and eternal life. The (male) reviewer might partially miss the hard facts, as the watery element is not easy to grasp for the intellect. The homeopathic drug proving and its main stories resulted in Germany & India and till today it exceeds national borders. The printed edition of the book is handmade by Indian women, while each copy seals a unique exemplar. A book, which apparently appeals to the female soul; if reaching the men´s, unsuspected unfolding reveals. what was lying withered long ago." Your book is beautifully designed, a real treasure chest. Too bad, that I have failed to ask you for a dedication. I will therefore insert your business card. I read in the book last night right up to page 46 and was deeply touched by the text. At the same time it scared me a little bit to look for and accept this soft, emotional side inside myself. Maybe this concern will be taken from the following pages. Kind regards, W.
- Homeopathy and art have never met with deeper and more passionate words! Thanks for this treasure! 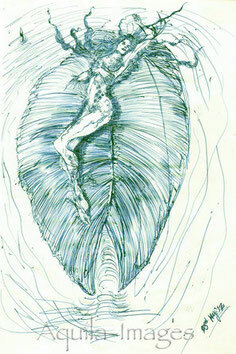 ... and I know and experienced and was part of the water lily in full truthfullness! Thank you Frauke Katharina George!!! E.
- While reading, one has the feeling of being in the middle of it oneself. - It is enviable, how the author captures emotions into words. Expressive style of writing. - The most genuine I have ever read. - Authentic, unadulterated, deep, 'skinclose'. - Homeopathic drug proving of Frauke Katharina George:How I came across the water lily in homeopathic form, I do not remember. Only that I talked to a colleague about it. She had the book of the remedy proving acquired by Mrs. George and recommended it to me. The book I received has a pink cover that can be tied and is handmade by Indian women. It was made with love, came immediately to my mind, unlike the other commercial available booklet, plump and quickly printed in normal font and then stapled together, just scant female. 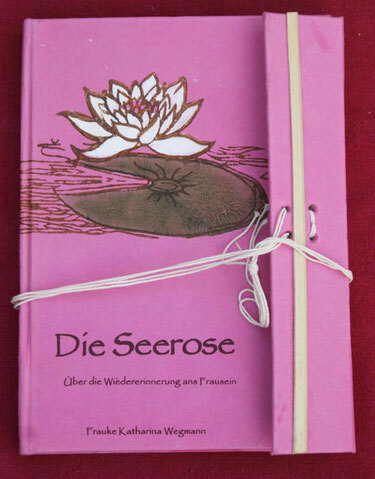 The pink cover with a printed water lily and the subtitle "Reminiscence of being a woman", made me feel like it should be about topics as: fear not to be in the right surrounding, fear of loss of control, to have no ground under your feet, all together: fear of drowning, fear of getting involved with men, respectively lack of confidence to engage in ones own feminine instincts and spirituality or even not to know about it oneself. Feeling, seeing with the inner eye. To expand, to glow out of oneself. In her book Mrs. George describes in a story which topics and complaints are treated by the water lily. Here is a small excerpt: Women's friendships that rearrange or dissolve. Getting told in young ages: "You are nothing and you can not do anything, you are only right, if you are like the others." Lack of confidence in ones own intuition. Compliments and beauty of every kind, including one's own, are perceived as a threat (which also makes it impossible to get involved with the opposite gender). Homelessness. Feeling of everything is too tight, too close within physical embrace. Menstrual problems, migraine, restlessness ... just to mention some ... * Read more symptoms in the book already mentioned. During treatment with the homeopathic remedy Nymphea alba, the patient has created a pond with 2 water lilies and is practicing in flowering. Thank you Frauke Katharina George.